At the GA Foundation we believe that education is a powerful tool for empowerment and change. We believe that by empowering an individual, you create a better future for a family, for a community and the country. The GA Foundation was founded in 1997 and we are proud to have been part of more than 30 of our employees’ children’s tertiary education thus far. “I would like to thank everyone in the company who has assisted me in the funding of my studies, accommodation and meals. I have had setbacks from the very beginning, but you guys backed and supported me. I really appreciate the trust that you put in me in managing my studies on my own. I cannot express how satisfying it is to be allowed to study a field in which one aspires to be in. There has been a few fails in my early years and yet you guys kept faith in me. *Jarryd was supported by the GA Foundation during his studies at the University of Stellenbosch. He graduated in 2015 as an industrial engineer and currently works as an advisory consultant for PWC in Cape Town. 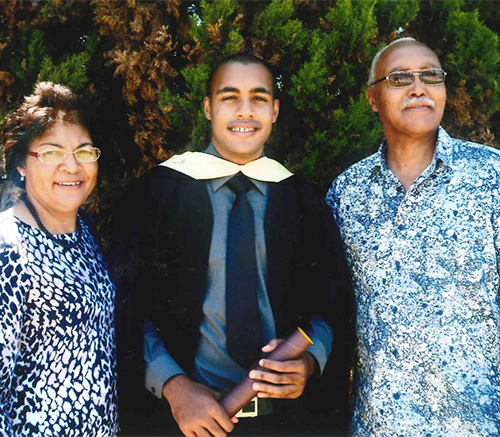 Jarryd at the graduation ceremony with his parents Eddie and Moira. Cape Orchard Company © 2019 All Rights Reserved.